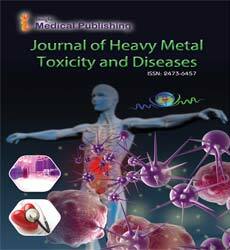 Journal of Heavy Metal Toxicity and Diseases is an open access Journal and publishes the articles after thorough peer review. Heavy Metal Toxicity refers to an overexposure to lead, mercury, arsenic, cadmium, chromium or other high density or metallic element that causes irritation or damage to the body. Heavy metals can be found naturally in the environment, in homes, or at the work place. Sudden severe exposures as well as moderate exposures over time can cause toxicity. Depending on the exposure, metals can increase cancer risk, impair production of red and white blood cells, causes Nausea, Vomiting, Rice-water diarrhea, Encephalopathy, MODS, LoQTS, Painful neuropathy, Blue vomitus, GI irritation/ Hemorrhage, Hemolysis, MODS (ingested); MFF (inhaled),Vomiting, GI Hemorrhage, Cardiac depression, Metabolic acidosis, Very high doses: Hemorrhage, Bone marrow Suppression, Pulmonary Edema, Hepatorenal necrosis. Open access journal is a platform, in which all articles are projected online with rapid review process and anyone in the world can access it with free of charge. The main aim of this journal is to provide the quality of data on Heavy Metal Toxicity and related diseases due to severe exposure to Heavy Metals. It involves intravenous injections of a chelating agent, EDTA (ethylene diamine tetra-acetic acid), a synthetic amino acid. Chelation therapy is treatment used in conventional medicine for removing heavy metals (including mercury) from the blood. Copper therapy is aimed at removing excess accumulated copper and preventing its reaccumulation. Copper overload results in Wilson disease. Chelation therapy drugs approved for treating Wilson disease include penicillamine (Cuprimine® and Depen®) and trientine (Syprine® and Trientine Dihydrochloride) both of these drugs act by chelation or binding of copper, causing its increased urinary excretion. Detoxamin is a new patented technique of Ca-EDTA chelation therapy medically equivalent to I.V. chelation therapy. The difference is Detoxamin introduces a smaller dosage on a nightly basis. The most important step in treatment is to prevent further exposure to lead. Various lead chelating agents include Succimer, D-penicillamine, Edetate (EDTA) calcium disodium (CaNa2 EDTA), Dimercaprol. Heavy metals are commonly defined as those elements with a high (>5.0) relative density. These Heavy metals accumulation is known as Heavy metal poisoning. Heavy metals most commonly associated with poisoning of humans are lead, mercury, arsenic and cadmium. Heavy metal detox can remove Heavy metal contaminants from body and minimize their impact on health. Chelation, a controversial metal detox procedure in which metals are purged from the body usually, by way of an intravenous administration of certain drugs. Natural chelation therapy uses natural chelating agents like amino acids. Other organic acids like Acetic acid, citric acid, Ascorbic acid, lactic acid also acts as Natural chelating agents. EDTA chelation therapy includes repeated administration of a weak synthetic amino acid (Ethylene diamine tetra acetic acid) which reduces atherosclerotic plaque and other mineral deposits by dissolving them.